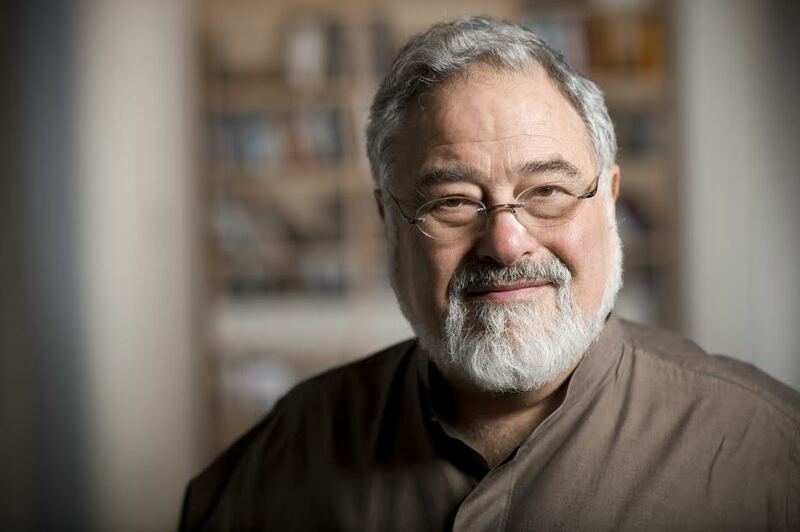 George Lakoff: Trump Tweets, Press Leaps. George Lakoff: Now that we understand how Trump uses Twitter to divert and distract, many of you have asked how we can respond. This handy chart by Greg Gibilisco contains useful information about how to fact check Trump and avoid the Tweet trap. 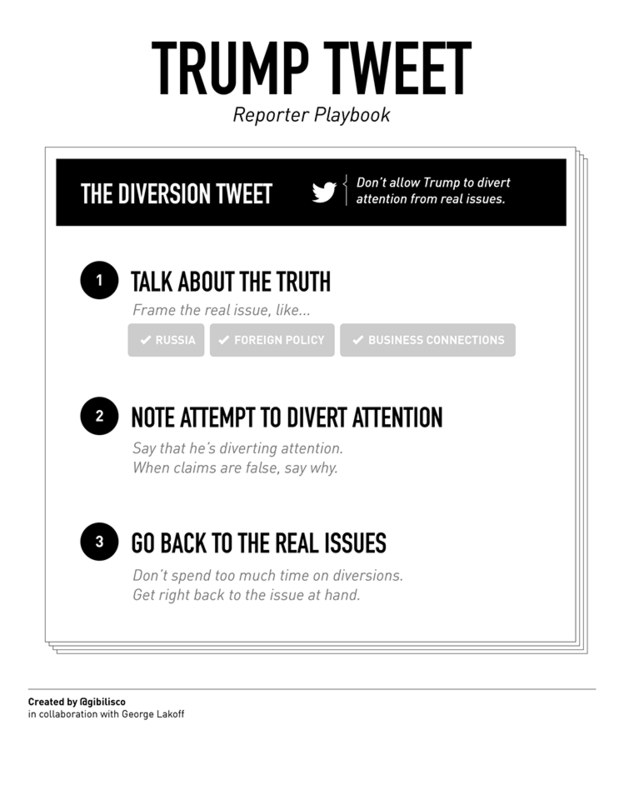 For an exploration of this analysis, see “Trump’s Twitter Distraction” by George Lakoff. George P. Lakoff (born 1941) is an American cognitive linguist, best known for his thesis that lives of individuals are significantly influenced by the central metaphors they use to explain complex phenomena. The conceptual metaphor thesis, introduced in his and Mark Johnson’s 1980 book Metaphors We Live By has found applications in a number of academic disciplines and its application to politics, literature, philosophy and mathematics has led him into territory normally considered basic to political science. In the 1996 book Moral Politics, Lakoff described conservative voters as being influenced by the “strict father model” as a central metaphor for such a complex phenomenon as the state and liberal/progressive voters as being influenced by the “nurturant parent model” as the folk psychological metaphor for this complex phenomenon. According to him, an individual’s experience and attitude towards sociopolitical issues is influenced by being framed in linguistic constructions. In Metaphor and War: The Metaphor System Used to Justify War in the Gulf, he argues that the American involvement in the Gulf war was obscured or “spun” by the metaphors which were used by the first Bush administration to justify it. The more general theory that elaborated his thesis is known as “embodied mind.” He is a professor of linguistics at the University of California, Berkeley, where he has taught since 1972. Photo, bio, and summary of George Lakoff’s ideas are adapted from Wikipedia. I favor the explanation I wrote about in HuffPost a couple of years ago: Trump supporters and a fair number of his opponents, too, are grown abused children. Abused children often become abusers themselves, but even in the best case, they are psychically sensitive to abusive personalities, which which they are familiar, often as “loving” icons. It’s a bigger problem than Trumpism: therapists agree, we are on the cusp, if not already over it, of becoming a nation whose majority of adults are victims of abuse. None of this negates George’s theories; in fact, it supports them. But it does suggest that the problem is deeper than personal peculiarities. And that if we don’t deal with it — acknowledge and combat rampant child abuse — we can expect more Trumps in the future, truly blighted leaders with no good intents. Fascinating! The strict father metaphor describes exactly Stephen Harper’s Conservative government in Canada, before he was voted out and Justin Trudeau became prime minister. He muzzled government scientists, tried to kill the CBC (national radio-TV), attempted to punish NGO’s whose programs were progressive by having them audited by Canada Revenue Agency (tax man), unfunded organizations that advocated for women, set up a snitch line for people to rat out those holding “un-Canadian values”, etc., etc., etc. He struck me then as the jealous, withholding father, constantly on guard for any sign of disobedience, and poised to mete out quick punishment. Conservatives always refer to more progressive ideas as ushering in “the nanny state”, characterized, in their view, by a gentleness and overprotectiveness (regulations) which would inevitably weaken (feminize) the nation. This is the first time I have encountered Lakoff’s conceptualizations, and it was startling to see that my own notions were not so far off the mark, inchoate though they were. The difference is, of course, that like most people, I let my ideas flutter about undeveloped, whereas a true scholar like Professor Lakoff takes those concepts in hand, and fleshes them out with the depth, strength and scope to become meaningful in the world. 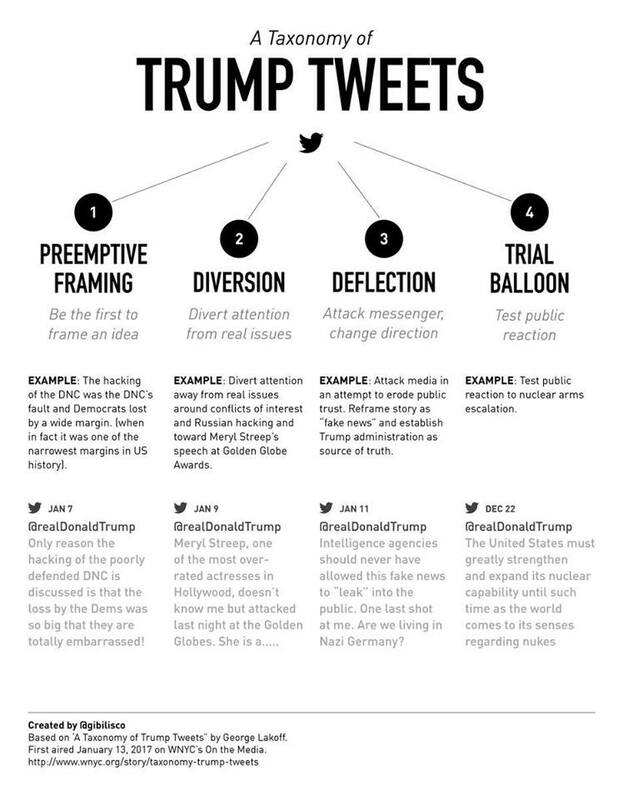 This entry was posted on March 14, 2017 by Vox Populi in Opinion Leaders, Social Justice, War and Peace and tagged A Taxonomy of Trump Tweets, Donald Trump presidency, George Lakoff, Greg Gibilisco, Trump Tweets Press Leaps.